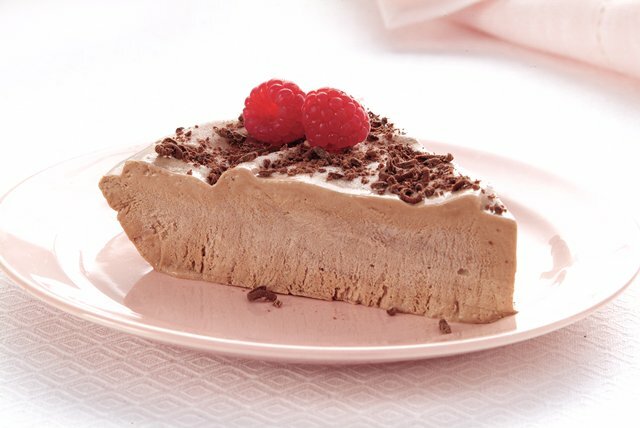 Fat-free milk, cottage cheese and chocolate pudding give this frozen chocolate-and-raspberry-flavor dessert a delightfully airy texture. Blend milk, cottage cheese and fruit spread in blender until smooth. Add dry pudding mix; blend 2 min. Pour into large bowl. Gently stir in COOL WHIP. Spoon into 8- or 9-inch pie plate; smooth top. Freeze 6 hours or until firm. Top with grated chocolate and raspberries just before serving. Instead of grating the chocolate, melt it as directed on package; drizzle over frozen pie. Top with raspberries. Let pie stand at room temperature 15 min. to soften slightly before cutting to serve. This easy-to-make pie can be frozen up to 24 hours before serving.